Could you launch a creative idea into market in 4 days or less? Unless you are a marketing nerd, or happen to be driving through rural France, you may have missed a very agile and enjoyable marketing tactic. 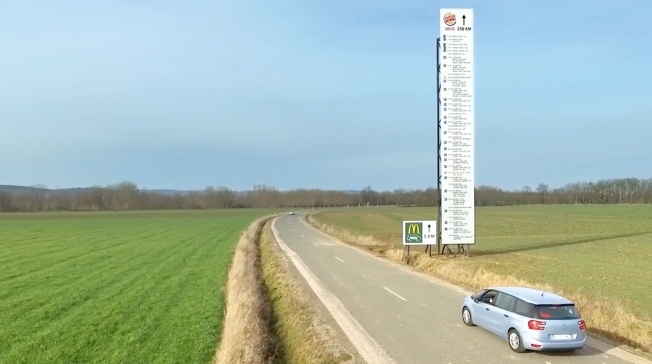 McDonald’s, breaking a long standing non-aggressive stance, decided to humorously deride its somewhat more tongue in cheek competitor Burger King with the following billboard that highlighted the easily accessible nature of McDrive roadside amenities relative to Burger King’s drive-through. Not to be outdone, Burger King turned around a clever retaliatory ad in less than 4 days! We see a very big difference between this past week’s exchange and the one that took place last year. Aside from differences in tone, the biggest difference is the speed to market of the communications! Last year, Burger King’s McWhopper communication included a website, packaging mock ups, and a thorough back up plan, all of which likely took significant planning. On the other hand, this most recent communication, which has garnered more than 1.3 million views to date, had a turnaround time of just 4 days! From a marketing and communications perspective, the agility required to turn an opportunity around in such a short period of time is extremely impressive. We are equally impressed that Burger King has enabled its creative partner in Europe, Buzzman, to be so agile. Given the response on social media, it is clear that this content has great virality and will likely increase drive-through traffic. The more interesting question however is, what are the long-term implications of this type of agility? If so, we applaud this agile marketing for driving both short-term business results, while also building long-term equity. Speaking of driving, whether your brand building journey is taking you through a McDrive or a Burger King drive-through, this is a great reminder to take advantage of every single consumer touch point to build your brand’s equity through relentless consistency. Brand builder or a burger lover, let us know what you think about this very agile marketing. « Are 6 better than 1?